The creases in her old, weathered skin made her appear wise and her smiling mouth with the two front teeth missing made her appear friendly and trustworthy. I was the first one of my group to spot her sitting on the floor close to the open doors of the ladies rail car on the train. I walked towards her and stood near the open doors of the train. She immediately returned my puzzled glance with a smile, as she waved her hand and motioned me to sit; in broken English she said, “Sit. Sit. Comfortable.” If you knew me, you would know that I am not a big fan of dirt and germs; however, I fought against the urge to say no and decided to live in the moment and sit right next to the open doors of the train. By now you must be imagining sitting on a seat in the train, but no, I was sitting on the floor since the rest of the seats were taken. As the train lurched and swayed towards our destination I was able to observe so many things. I had counted the days and dreamed of this trip for the past five months, as I was thrilled to be in such different surroundings. My vision was limited, however, by the walls that ran parallel to the tracks. They must be there to reduce the noise or perhaps to stop people from jumping on the train without paying. As we careened over the bridges, I was struck by how high off the ground we were, while at the same time I enjoyed the views during these short stretches of time, as the bridges didn’t have the same impenetrable walls as the rest of the tracks. Riding on the ladies rail car. From left to right: Sophia Pessagno, Emma Wetenhall, Kassidy Hadley, Hannah Metwally. Chennai Railway. Pessagno, Sophia. 2017. Photograph. The train ride into the city was pleasant enough; people were walking around the train selling different items and people would board and disembark the train at each stop. The train ride we took back was a completely different experience. We got on right at peak rush hour. It was a nightmare. So. Many. People. At first it wasn’t too bad. And I kept telling myself that it couldn’t get any worse. 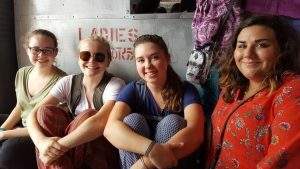 Was I wrong… as more people boarded the train to get home I was pushed closer and closer to my travel companions to the point where my head was almost resting on Kassidy’s shoulder. As if that wasn’t bad enough it got tremendously hot and stuffy in the rail car, and the foul odor started to increase. Rush hour on the train. Chennai Railway. Pessagno, Sophia. 2017. Photograph. Given that I have only taken the train twice in India, my first-hand knowledge on the urban public transportation in India is limited. However, with just these two trips, I can attest to much of the information that John Pucher and colleagues describe in their article, Urban Transport Crisis in India. I agree that the infrastructure is not sufficient enough to account for the ever-increasing population size. 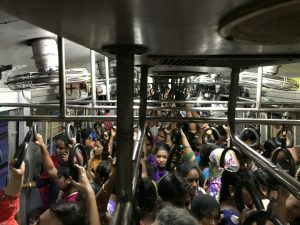 Like most cities in developing countries, Chennai has experienced an incredible amount of illegal construction as well as haphazard development in its suburbs; this unplanned and poorly planned development makes expanding the public transportation harder. Aside from trains, city planners are also challenged by the variety of transport used in urban areas, all of which must share the same narrow streets, which frequently lack signage and stop lights. The poorest walk or ride bikes. According to Pucher et al., 90% of Indians use buses as urban transport, but these buses crawl along at a snail’s pace, dodging walkers, motorcyclist and auto rickshaws. Another major issue is that a large majority of the population makes extremely low wages and cannot pay the minimum cost in order to take the train or other forms of public transportation. This also contributes to the lack of financing for an expansion of the public transportation system. Pucher and colleagues argue that the private sector should contribute to financing public transportation if there is not sufficient public funding by charging those who can afford cars high taxes on their vehicles and gasoline. They highlighted Bogota’s relatively inexpensive TransMilenio Bus System as one that could be successfully and affordably implemented in numerous cities in India, including Chennai. One of my good friend’s dad just moved to Bogota, and he hasn’t bought a car yet because the fastest way for him to commute from the suburbs to his university job in the city center is to take the bus since the buses have dedicated lanes. Given that the Pucher et al. article was written in 2004, I plan to do further research to learn if Chennai or Bangalore have developed some of these dedicated bus lanes. 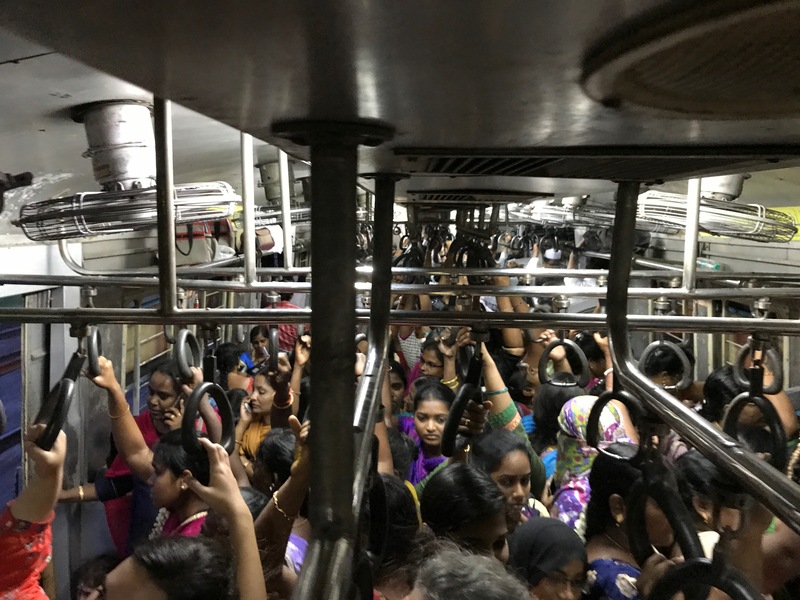 Optimistically, with changes such as this one to the transportation system in India, the public transportation would be able to handle the increasing population size and hopefully reduce traffic on busy roadways. But now, back to my train ride. My stop finally arrives, and my group and I push our way through the sea of humanity to get off the train. Despite my complaints about the overcrowded and smelly experience, I am grateful that we can afford to take the train. If not, the same journey would have taken perhaps 2-4 times longer. While only 10% of the population regularly takes the train, because the population size has tripled over the last 30 years, the train infrastructure is woefully inadequate for the ever-increasing number of riders I look forward to learning how the Indian government and city planners envision future transportation projects so that a more substantial portion of the population can travel efficiently and safely through their city.